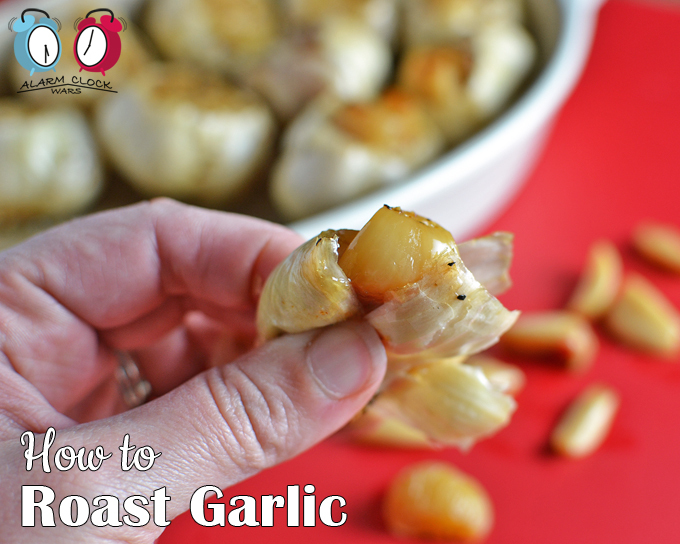 Roast garlic has the most divine flavor… Once you see how easy it is to roast, you’ll want to add it to everything you cook! Have you ever roasted garlic before? John and I are both huge fans of garlic, and my garlic press is one of the kitchen gadgets that I just can’t live without. But I went a very long time before I actually roasted my own garlic. Roast garlic is one of those things that sounds fancy, and sounds like it should be really hard. But I’ll let you in on a little secret. And it tastes so good… you have almost no excuse to not do it! Get garlic bulbs that are big enough. Smaller bulbs will have smaller cloves, then you’ll work hard for less garlic. So buy bulbs that are a good size. The ones I had were on the small side. Peel off any of the papery outer layers that will easily come off. This just makes things a little less messy at the end. Cut off the top of the garlic bulb. You want to be able to see the tops of the garlic cloves. This will help get the olive oil down into the cloves for roasting, and it will make it easier to get the roasted cloves out at the end. Stand the garlic up in a shallow pan. (I used a 2-cup stoneware pan, but something like this would work great, too.) If you’re only doing 1 or 2 heads of garlic, just wrap them in aluminum foil. Pour extra-virgin olive oil over the cut garlic cloves. Drizzle so everything is covered. As the olive oil seeps down between the skin and the cloves, add more. When you think there’s enough, add just a little bit more. Then sprinkle with salt and pepper (I used Lawry’s seasoned pepper) – as much as you want. I used about 1/4 teaspoon salt and 1/8 teaspoon pepper for 8 small heads of garlic. Cover loosely with aluminum foil and bake on 350 degrees for at least 45 minutes. You want the garlic cloves to turn a delicious golden brown color (like in the photos here) and be very soft. If the garlic doesn’t look quite done at 45 minutes, leave the garlic in the oven for another 5-10 minutes and check again. I roasted this garlic for 65 minutes before I was happy with it. The longer you leave it to roast, the more subtle the flavors become. When the garlic is done, let it cool uncovered for 10-15 minutes. When it’s cool enough to handle, just pinch the bottom of the head and squeeze the cloves out the top! If you cut off enough of the top of the head, this shouldn’t be that difficult. You may still have to work a bit to get the cloves out of the middle. 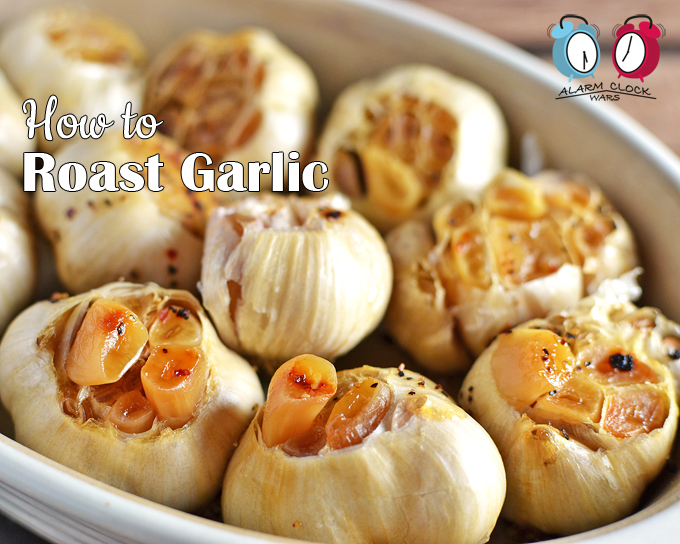 Use the roasted garlic right away, refrigerate it (covered) for up to 3 days, or freeze it for up to 3 months. I’m going to make a big batch and add this to my rotating freezer stash! 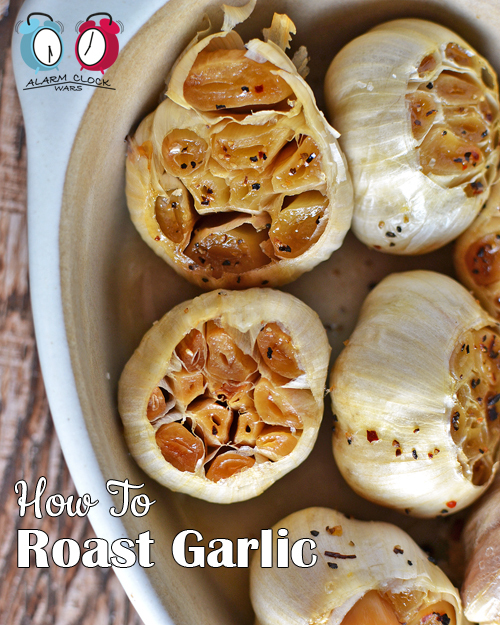 What recipe will you try roasted garlic in? Roast garlic has a mellow, sweet, nutty flavor. It's perfect for so many dishes, and it's so easy to make! Peel off any of the loose papery outer layers of the garlic head. Be sure to leave all cloves attached. Keeping the head of garlic intact, cut off the top of the head to expose all the cloves (about ¼ inch). Stand garlic with the cut side up. Drizzle with extra-virgin olive oil, allowing oil to settle between the peel and cloves. Repeat at least once. Top with a dash of salt and pepper. Wrap loosely in aluminum foil. Bake at 350 degrees for at least 45 minutes, until garlic cloves are soft and golden brown. To roast multiple heads of garlic, place garlic in a small pan, cut sides up. Drizzle with olive oil, salt, and pepper as directed above. Cover pan with aluminum foil and roast as directed above.